Many different manufacturing processes are used to actually manufacture tooling for mold making. Most mold making involves CNC machining, or subtractive processing of the material. Other operations besides milling are used, including 3D printing and EDM operations. Moldmakers today are under pressure to create their mold tooling faster than ever before. 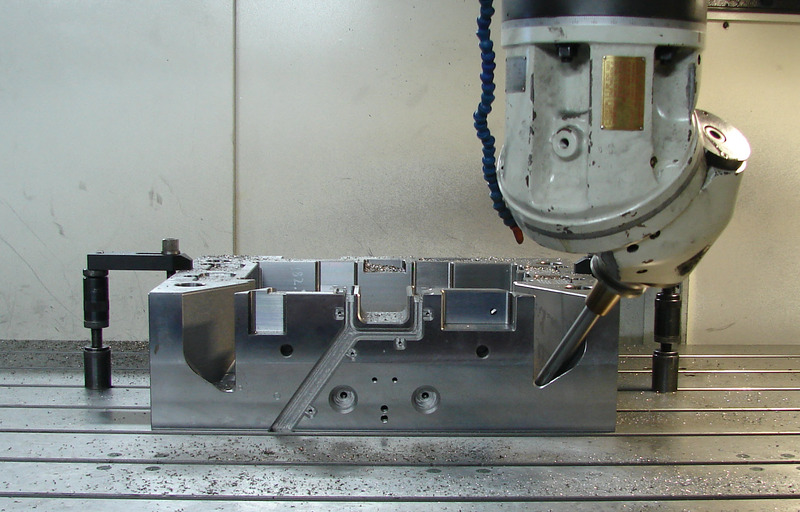 Although EDM manufacturing is valid in many cases, it’s important to explore whether some cases can be replaced with faster methods, such as CNC machining. EDM stands for Electrical Discharge Machining, sometimes referred to as “spark machining” or “edm sinking.” It is where an electrical current is passed through an electrode which in a di-electric medium. The electrode is made in the shape of the material that needs to be removed from the mold tooling. The spark erodes the material to form the desired final shape. EDM as a process was developed by the Lazarenko Brothers in the then Soviet Union during the second World War. Electrodes are typically made out of carbon graphite; however copper, brass, copper alloys and other materials can be used as an electrode. The electrodes generally need to be manufactured before they can be used in an EDM machine. For sharp inside corners. This is one of the biggest advantages to EDM manufacturing, the ability to create sharp corners that otherwise would require CNC mills of incredibly small diameters. Deep areas of the mold. EDM processes were often used instead of CNC milling because it was not possible to get cutting tools deep enough to mill the correct shape. Very complex geometry. Conventional wisdom is that complex shapes are easier to get via EDM manufacturing. Rib Machining. Ribs in molds are typically thin and can be quite deep. EDM operations are often commonplace in those specific areas. Unattended operations. In the past, shops were more apt to run an EDM sinker machine unattended, rather than a CNC mill. Where EDM surface finish is specified. The finish from EDM operations is consistent, without machining scallops or swirl patterns. Sometimes this finish is specified as part of the part. Some places where you can not use EDM is in areas of HAZ, or Heat Affected Zones. These are zones, perhaps weld areas, where the heat from EDM operations would cause more problems than they solve. Due to tolerance stack-ups of electrodes and holders, plus not knowing the exact size of the electrical spark, areas requiring high precision are often not suitable for EDM. The biggest disadvantage to using EDM processes is that it is slow. You first need to use the CNC mill to mill the electrode. Often you will need to mill multiple electrodes for one EDM operation because they erode away too, and it can take multiple electrodes to EDM one area. Then you have the EDM process, which has a slower metal removal rates than milling. Basically, not only is the EDM process slower, but you still need to use a CNC machine to mill one or more electrodes before you can use the EDM machine. Besides that, milling graphite electrodes creates a lot of dust and is messy. Without a dedicated CNC mill, with a high end vacuum system, for graphite dust, you have machine down time every time you switch from milling metal to carbon just for cleaning. If you are a moldmaker, and want to shorten the time required to manufacture molds, than replacing as much EDM work with CNC machining is one of your first priorities. Although there may not be a lot that CNC milling can do about inside sharp corners, there are newer hardware and software technology that mitigates the other advantages EDM once had. Using electrodes and an EDM process was common for deep areas of the mold, but the growth in 5-axis CNC mills to the moldmaking community has changed this paradigm. During moldmaking, most 5-axis machines are operated in a 3+2 axis operation, rather than full simultaneous 5-axis machining. Operators and programmers are able to rotate the tool axis, to something other than straight up in Z, and machine deep areas without the need for EDM operations. 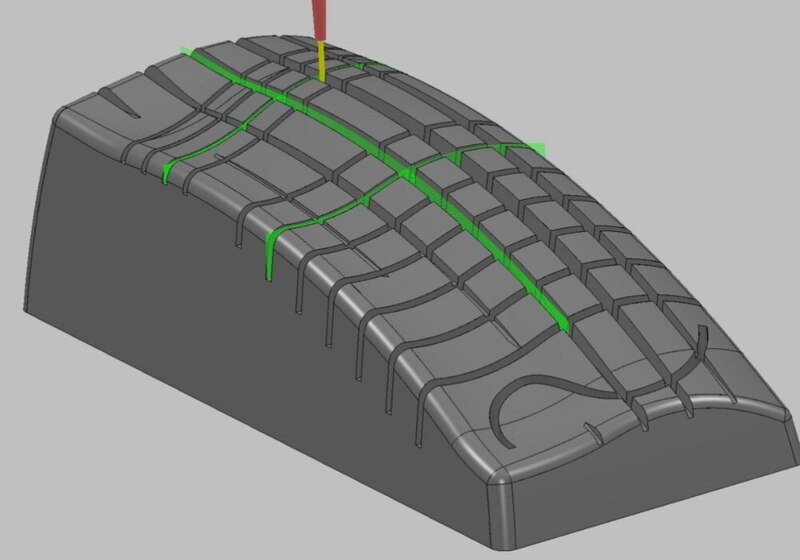 Fortunately, modern CAM software has improved and simplified the capabilities of multi-axis machining for molds just as the machines themselves have improved. Successfully milling deep areas with 3+2 or 5-axis machining requires collision avoidance and simulation of not just the tool, but the tool holder, spindle and other parts of the machine which potentially collide with the part being milled. This step is usually performed within the CAM system, or through a 3rd party simulation and verification software package. Milling ribs within a mold can be difficult, as they require tooling with large LD (length/diameter) ratios. These tools are more apt to deflect, vibrate or break. Additionally, chip evacuation within the rib becomes an important consideration. Despite the difficulties, milling ribs can be considerably faster than using EDM to create them. CAM systems which include functions specially for rib machining make the job of programming them easier. These programs may step down along the tool axis, or they may morph or follow the contours of the rib. In either case, small axial depths of cuts allow for safely milling ribs. Tooling would normally utilize heat shrink holders for rigidity, and the cutter used normally would allow for good chip evacuation, with strong flood or air to assist in evacuating chips. Tools and tool holders are more rigid with shrink fit and other technologies. Milling machines are smoother with built in High Speed Machining capabilities and smoothing operations. CAM programming software has more options and programming methods, including automatic rest machining, for milling complicated shapes. While it seems scary to run an expensive 5-axis machine unattended, this is exactly what many advanced moldmakers are doing to increase efficiency and improve mill uptime. The previously mentioned simulation software for multi-axis machining also can be used to verify that programs are collision free, and can be run unattended. Algorithms that automatically switch cutting tools with fresh ones after a certain amount of use allows for longer unattended run times. This is especially useful for large parts. Milling operations in moldmaking offer faster removal rates than EDM operations. Advancements in tool holding, 5-axis machines, and CAM programming software have allowed for the replacement of many EDM operations with a CNC milling operation. This can shorten time to ship for molds and related components.